Economists' role in society has always been an uneasy one, and in recent years the ethicality of the profession and its practitioners has been questioned more than ever. 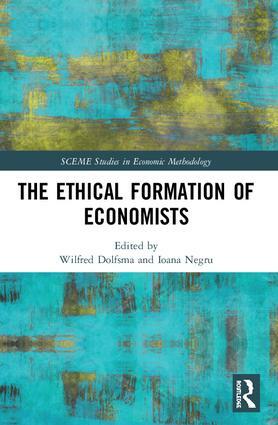 This collection of essays is the first to investigate the multifaceted nature of what forms economists' ethical and economic views. Bringing together work from international contributors, The Ethical Formation of Economists explores the ways in which economists are influenced in their training and career, examining how this can explain their individual ethical stances as economists. The book suggests that if we can better understand what is making economists think and act as they do, considering ethicality in the process, we might all be better placed to implement changes. The intent is not to exonerate economists from personal responsibility, but to highlight how considering the circumstances that have helped shape economists' views can help to address issues. It is argued that it is important to understand these influences, as without such insights, the demonization of economists is too easily adapted as a stance by society as well as too easily dismissed by economists. This book will be of great interest to those studying and researching in the fields of economics, ethics, philosophy and sociology. It also seeks to bring an ethical debate within and about economics and to cause change in the practical reasoning of economists. 9. Intervention, policy and responsibility: economics as over-engineered expertise? Wilfred Dolfma is Professor of Business Management & Organisation at Wageningen University, The Netherlands. He is the author of numerous books and articles, and was editor-in-chief of the Review of Social Economy and is associate editor for the European Journal of Management. Ioana Negru is Reader in Economics in the Faculty of Economic Sciences at Lucian Blaga University, Sibiu, Romania. She is a member of Reteaching Economics, and Skidelski Group for Economics Curriculum Reform.